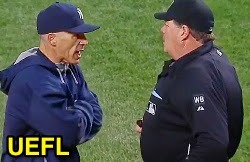 HP Umpire Jerry Layne ejected Yankees Manager Joe Girardi for arguing a strike three call in the bottom of the 5th inning of the Mets-Yankees game. With two out and two on, Yankees batter Kelly Johnson took a 0-2 cutter from Mets pitcher Daisuke Matsuzaka for a called third strike. Replays indicate the pitch was located off the outer edge of home plate and belt-high (px -1.198, pz 2.469), the call was incorrect. At the time of the ejection, the Mets were leading, 11-5. The Mets ultimately won the contest, 12-7. This is Jerry Layne (24)'s first ejection of the 2014 MLB Regular Season. Jerry Layne now has -2 points in the UEFL Standings (0 Previous + 2 MLB - 4 Incorrect Call = -2). Crew Chief Jerry Layne now has 3 points in the UEFL's Crew Division (3 Prev + 0 IC = 3). This is the 42nd ejection of the 2014 MLB Regular Season. This is the 16th Manager ejection of the 2014 MLB Regular Season. This is the Yankees' 5th ejection of 2014, 1st in the AL East (NYY 5; TB 3; BOS 2; TOR 1, BAL 1). This is Joe Girardi's first ejection since May 5, 2014 (Laz Diaz; QOC = Y [Balls/Strikes]). This is Jerry Layne's first ejection since Aug 25, 2013 (Mark Parent; QOC = U [Pre-Game Conf]).